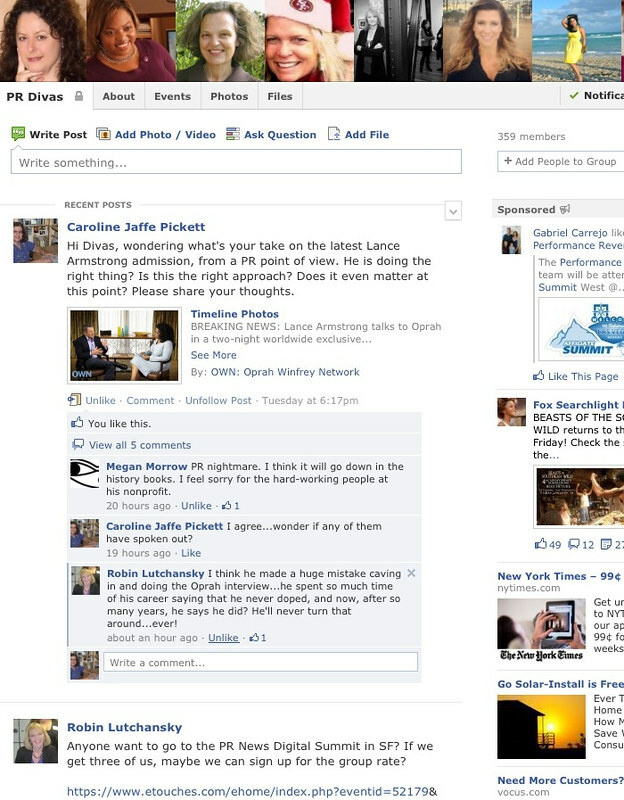 "Wondering what's your take on the latest Lance Armstrong admission, from a PR point of view. Is he doing the right thing? Is this the right approach talking to Oprah? Does it even matter at this point? Please share your thoughts." An interesting discussion has been unfolding, as highlighted in the screenshot below, ranging from views that there is "no going back," to the role his nonprofit will now play. Caroline Jaffe Pickett He has a long road ahead to turn his image around. If I were advising him, I would suggest 1. a high profile focus on charity work and donations 2. a new book where he could at least explain his state of mind for his behavior, and 3. publicity for influencers who have publicly forgiven him. It's interesting that during the course of this week, pretty much all of these events are happening in some form, or look like they are going to. 1. An article in Monday's Huffington Post describes Armstrong's apologies to Livestrong, his foundation, with a rededication to the cause of fighting cancer. 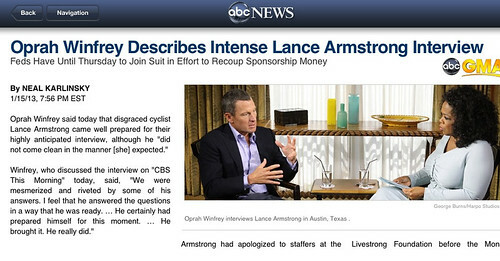 Livestrong's leaders are also holding fast to their connection with the cause, and downplaying the Armstrong connection. Not a huge surprise there, although I'm certain Lance will try and rebrand and make good by affiliating with other causes, while he unfortunately watches his sponsors drop off and legal troubles mount. 2. I'm not sure if a new book by Armstrong is in the works, but numerous other authors are stepping up to the task, including, as Media Bistro reported in November, "Cycle of Lies," by New York Times sports reporter Juliet Macur. “Cycle of Lies" will prove definitively that Armstrong's extraordinary career had nothing to do with the bike,” David Hirshey, HarperCollins’ executive editor, told the Post. Well, it wasn't about the bike anyway, as Armstrong himself wrote. 3. In a recent Huffington Post article, "Lance Armstrong Was Superman to My Friend," actor Emile Hirsch describes support and caring a friend received from Armstrong, when he too faced a similar cancer diagnosis. Hirsch states: "Without Lance's guidance and support to my friend at such a crucial juncture in his diagnosis and life, I honestly don't know what would have happened to my friend; that was the kind of support Armstrong gave him. My friend went on to survive. So, let's not throw the baby out with the bathwater." It will be interesting to see if Armstrong has any other supporters who will try to highlight the good he did and downplay the lying and the profits. Although they risk tarnishing their own image in the process, don't you think? What other strategies can help Armstrong's turnaround? What do you think?